The listings below include locations in the Las Vegas area. Check out the "Steamiest Places" section for attractions likely to be of greatest interest to steampunks. Where most people see a conga, Professor Jakob J. Tittiger sees a Steampunk Submersible. A butter churn? No, it's a core component in a Steampunk Proton Pack. 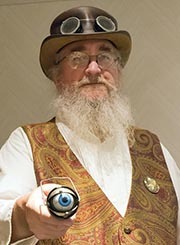 From objects like these, he makes contraptions seen at steampunk events. . .